Where do I use my ao.com voucher code? Find a code you would like to use on NetVoucherCodes, click it and copy the code. Follow our link to ao.com and find the products you would like to buy then click ‘Add to Basket’. When you've finished shopping, click the shopping basket. Review your order, then scroll down and click the text that says ‘I have a discount code’. A box will appear, enter your code and click ‘Apply’. Your basket total will show any discounts applied. Click ‘Checkout now’ and enter your payment details, delivery address and complete your order. "Be rewarded for saving the planet, and trade-in your old appliance with ao.com to get cash back. They’ll even collect it from your home free of charge!" Shopping for all your electricals doesn’t have to be a hassle, with just a few clicks online at AO.com, it’s easier than ever to kit your home out with all the essentials you need. AO has revolutionised the way we shop for technology, so you can keep your home running like clockwork at ease! 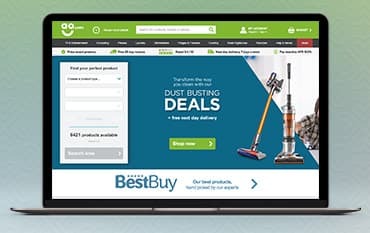 So, if you’re in need of a new washing machine, microwave, freezer, dishwasher, Tumble Dryer, TV or any other household necessity plus smartphones and computing products, AO.com is your one-stop shop. Their customers are their first and foremost priority which is why you can find a selection of unrivalled delivery and installation services on top branded products, 7 days a week! If you have temperamental appliances which need replacing, don’t be fooled into paying extortionate prices and head over the AO.com offers section where you may snap up an unbeatable deal. Uncover leading technology delivered straight your door at AO.com and enjoy only the best, top quality branded products selected with you in mind. Enjoy their Best Price Guarantee too so you can rest assured you’re paying the most affordable price around for your goods. From finding the right products for your home to your shopping experience and your bank balance, AO put you, the customer first! Shopping with a discount code from NetVoucherCodes could help bring the costs of your goods down even more, so what are you waiting for? Replacing your old household appliances or treating yourself to the latest technology in Home Entertainment doesn’t have to be as expensive as it seems. The offers section over at AO.com features a wide selection of discounted goods featuring some of the best brands on the market. And what’s more, with a Voucher Code, you could save even more when you next purchase online. Browse from a wide collection of TV’s, Home Cinema & Soundbars, Audio, Blu-Ray & DVD Players, Digital Set Top & Smart TV Boxes and TV Accessories and more! At AO, they understand that when something in your home gives up on you, it can be a stressful time until it’s replaced! However, it can cost a small fortune to replace household items whether it’s your washing machine or dishwasher, which many people simply can’t afford. It’s for this reason at AO, they offer a more manageable way of paying for your new appliances. Enjoy interest-free credit over 6 or 12 months on a range of products with AO.com, making those all important costs more manageable for you. What’s more, with a range of flexible delivery options, your goods will be with you in a flash when it suits you. When it comes to our home entertainment, many of us like to keep up to date with the latest technology, whether it be the latest Apple device or 4K TV, you can find all the newest goods online at AO.com. Watch television like you never have before with the stunning quality of 4K TV, or kit your living room out with a full surround sound system for that cinematic experience in the comfort of your own home. Whether you’re a tech geek or simply want to treat your home to the modern technology it deserves, shop for all this and more with AO.com where you can expect nothing less than excellent customer service and top branded products at unbeatable prices. Whether you’re in search of a new washing machine or tumble dryer, or your existing one urgently needs replacing, the selection of laundry goods at AO is second to none. Shop washing machines from all the leading brands including Bosch, Neff, Hotpoint, Indesit and much more. With the added bonus of a Promotional Code from NetVoucherCodes, you’re sure to snap up a low price deal! Find everything from freestanding washing machines to integrated, all laundry appliances can be bought with installation service, so as well as not having to worry about the price, you don’t have to worry about having it installed in your home either. Standard Delivery is Free and you'll be able to choose a time slot to suit you, 7 days a week. Click & Collect is available on some small TVs and appliances, more information check the delivery section at AO.com. If you’re wanting to make a return, you will need to let AO know within 30 days of delivery free of charge. More information on how to return your item. Voted as the ‘Best UK retailer in 2016 by the public in the Verdict Retail’s Customer Satisfaction Awards, it’s no surprise that AO.com is the best online store for all your home electricals and technology. In fact, at AO.com, you can uncover all the latest goodies in the world of tech including the newest smartphones, laptops, TVs and essential appliances. Think big brands including the Likes of Apple, Samsung, Bosch, Hotpoint and much more with unrivalled prices you won’t find anywhere else. Shop with NetVoucherCodes for an unbeatable AO.com voucher code to help you save extra on the things you need at AO! We are constantly on the hunt for first order Voucher Codes for ao.com to help you with your money saving. Our experts check dozens of sites for secret codes including NHS discounts, student sites & social media channels saving you time & money!